East End Events- Kami Stum: Got home from mission trip to Peru. I had amazing time and would like to thank everyone who remembered me in their prayers. USDA Update-Rod Johnson: Computer problems continue to plague the USDA Service Center in Eads. We have been without e-mail and communications capabilities for 2 weeks now. Wild Horse Roundup-Curtis Schrimp: I saw the first for me on TV when they showed the Wild Horse temperature in large letters. I don't know who called it in, but it was fun to see! 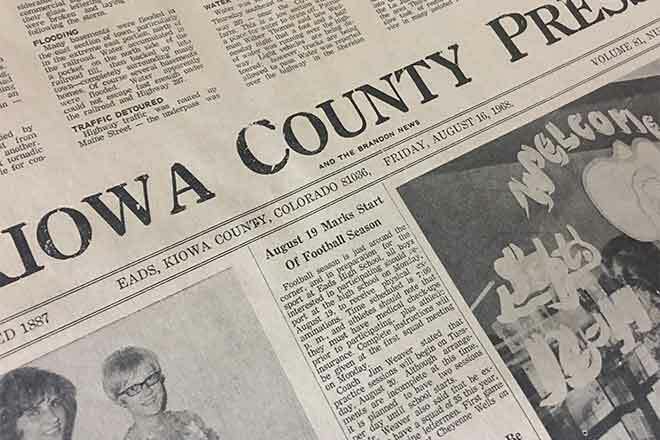 About Town- Ida Lessenden: Because of the strong winds last Sunday, many folks were forced to have their fireworks and picnics indoors or later in the week. Colorado Governor Roy Romer requested disaster assistance for farmers in Kiowa County reeling from its fifth serious hail storm this year. Nursing Home News-LaVerne Fischer: Cecil Blekeburg, Joan Crow and Allen Derby came down from Kit Carson to entertain with some "hoe down" music. Senior Citizen News-Ethel Johnson-Rhua Sloan: Two of the ladies in the dry brushing class have almost finished a flock of mallard ducks. They are beautiful. The Town of Eads received notice that the Public Utilities Commission of the State of Colorado has set a hearing date in regard to the closing of the depot in Eads by the Missouri Pacific Railroad Co.
Miss Karen Teeter of Sheridan Lake is the state winner of the Colorado Angus Association scholarship contest. Miss Teeter is now entered in the national competition. Novice 11 year old bowler, Sonya Sheridan, participating in the Scotch Doubles, converted the impossible "big four" split. Leo Hollis, mechanic and farmer residing northwest of Eads, suffered painful injuries when an acetylene generator blew up in his face. Oil in commercial quantities has been struck in the well being drilled by Allied Oil and Refining Co. for the Colorado Oil and Development Co. This fact, which was made public by R.A. Totten, secretary of the Allied Oil & Refining Co., assures the futures of Eads as a great oil center.